Homer is often called the "Camelot by the Sea" because of its exquisite beauty. 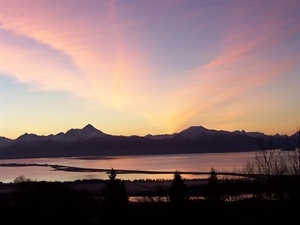 It is nestled at the end of the Kenai Peninsula on Kachemak Bay with spectacular views of the Kenai Mountains and 5 glorious glaciers which line them. Homer's biggest attraction is our sport fishing adventures, and in fact, Homer is the "Halibut fishing capital of the world". We also have annual events such as the Winter King Tournament and the Halibut Jackpot Derby which are main attractions and big ticket draws-along with our annual Shorebird Festival. Homer has numerous events and happenings throughout the year that are festive and bring people and communities together. Never a dull moment in Homer, Alaska! Singer/Songwriter Jewel grew up performing at Homer's Pier One Theater! Homer LOVES the arts! Homer has shuttle service between Homer, Anchorage, Seward, and Kenai/Soldotna. Homer also has the Homer Trolly with runs during our spring and summer seasons, and provides "hop-on/hop-off" service in Homer and on the Homer Spit for a reasonable fee. Jan 19.0 F° 25.0 F° 31.0 F° 2.6 "
Feb 20.0 F° 26.5 F° 33.0 F° 1.8 "
Mar 23.0 F° 30.0 F° 37.0 F° 1.6 "
Apr 30.0 F° 37.0 F° 44.0 F° 1.1 "
May 37.0 F° 44.5 F° 52.0 F° 0.8 "
Jun 44.0 F° 51.0 F° 58.0 F° 0.8 "
Jul 48.0 F° 54.5 F° 61.0 F° 1.6 "
Aug 47.0 F° 54.0 F° 61.0 F° 2.3 "
Sep 41.0 F° 48.0 F° 55.0 F° 3.3 "
Oct 32.0 F° 38.5 F° 45.0 F° 2.6 "
Nov 24.0 F° 30.0 F° 36.0 F° 2.8 "
Dec 21.0 F° 27.0 F° 33.0 F° 3.1 "
Spring temperatures are cold with averages in the upper 30's and highs in the mid 40's. Nights are cold with lows in the upper 20's. Summer temperatures are cool with averages in the low 50's and highs in the upper 50's. Nights are cold with lows in the mid 40's. Fall temperatures are cold with averages in the upper 30's and highs in the mid 40's. Nights are cold with lows in the low 30's. Winter temperatures are cold with averages in the mid 20's and highs in the low 30's. Nights are cold with lows in the upper 10's.